An interim committee of lawmakers has moved a plan to fix the state’s pension systems one step closer to the 2013 Legislature. The proposed bill start with the pension fix proposed by the Schweitzer Administration. The State Administration and Veteran Affairs (SAVA) Committee has voted to approve bills to potentially fix debt problems plaguing the state’s two biggest employee retirement systems. The Public Employee Retirement System and Teachers Retirement System are expected to be about $3 billion in the hole over the next 3 decades.Wilsall Republican Senator Ron Arthun. “We need to address this because we’re getting so much farther behind on our unfunded liabilities,” said Wilsall Republican Senator Ron Arthun. Arthun joined a seven to one majority passing a bill for the Teachers Retirement System. The bill has both the employees and employers paying more into the system to correct the shortfall over the long term. Then coal tax revenue would fill in the rest. A fix for the Public Employee Retirement System generated a little more debate in the SAVA committee. A bill for that system passed 5 to 3. This fix has much of the same framework as the teachers plan; an infusion from natural resource taxes and more from the employees. The controversy here comes in asking for more from the employers, which are many times city and county governments. Some public comment at the meeting accused the committee of trying to balance the budgets of the pensions on the backs of local governments, leading to forced tax hikes. Senator Arthun says it has to be a shared sacrifice. “I think some of the burden has to be shared by the local governments,” Arthun said. Executive Director of the Montana League of Cities and towns Alec Hansen says local governments are willing to make a reasonable contribution to solve this problem. “It’s vitally important to restore actuarial balance to those programs. It’s also vitally important to protect the retirement benefits of our employees,” Hansen said. The bills passed by the SAVA committee now move over to the Legislative Finance Committee for another review. SAVA will view them again in November before making a decision on whether or not to send the measures to the 2013 Legislature. The numbers are in for how the state’s top pension systems performed over the last year in the stock market. The investments made money, but not very much. These pensions have been in debt for about a decade and are an increasing budget concern for the state. The ailing pension system is shaping up to be a top priority for the 2013 Legislature. State lawmakers are now weighing a proposal from Governor Brian Schweitzer to fix the pensions. The gubernatorial candidates seeking to replace him disagree on what they want to see..
It’s sort of hard to paint a clear picture of how big of a deal state pension problems are because it all unfolds over a long time. Let’s put it this way—over the next 30 years the state’s two biggest public employee pension systems, or retirement plans, will be $3 billion in debt if the current system does not change. To put that in perspective, the state’s annual budget is about $2 billion. And how do these pensions make money? Well, the employees and employers put in money, and it’s diversified by the State Board of Investments. The board recently received the figures for how much the pensions earned in the stock market over this last year. Board Director David Ewer says it was about 2.4 percent. “It’s a very challenging environment for investors globally,” Ewer said. 2.4 percent is not very good. Ewer says the systems have earned an average of just under 6 percent over the last decade. In order for the stock market to pay back the debt on these retirement plans—Ewer predicts they would have to earn an average of about 9 percent over the next 30 years. It’s hard to say for sure, let’s say between 8 and 11 percent. Either way, that’s probably not going to happen. “I think I can fairly say that I think it’s unlikely that investment returns on their own will sufficiently close the gap that needs to be closed if you’re going to have for the long term a truly viable pension system,” he said. Several bills to address the pension system are in the drafting stage right now. The one generating the most interest comes from Governor Brian Schweitzer’s budget office. It calls for increasing the amount paid into the plans from the employers and the employees. And then it includes a new cash infusion from the money earned on state trust lands. Schweitzer calls this an incremental approach that would fix the pensions over the long term, but says state lawmakers need to get on it. “We agree with a great deal of what the Governor’s proposing here,” said Republican gubernatorial candidate Rick Hill, one of two men looking to replace Schweitzer in this November’s election. He agrees with Schweitzer this is an issue of utmost importance, Hill actually thinks the problem is worse than what’s been presented. He agrees fixing the pensions needs to be a shared responsibility. But Hill does not want to use state trust land money for the pensions. He says those funds should not go to one small group of beneficiaries, the state employees. “We believe we should seriously look at moving to a defined contribution plan for new hirees so that we’re not perpetuating this problem into eternity,” Hill said. Democratic Gubernatorial candidate Steve Bullock does not speak about pensions with the same urgency as his predecessor or his opponent. Although, Bullock does say the next legislature should address the issue. As for the state trust land cash infusion, he says there will need to be some kind of new money propping up the pensions. “Be it from some of the resource development or other, you know over time we need to chip away at it and that could be a good area to do it,” Bullock said. But, Bullock does not agree with moving all new hires to 401Ks. He thinks it is good enough that it is now an option for new employees. “Having that as an option makes a lot of sense. Switching out to everybody I don’t think does,” Bullock said. While one of these men will be holding the veto pen next legislative session, their influence will first require the state legislature pass a pension bill. An interim committee of state lawmakers moves Governor Brian Schweitzer’s proposal to fix Montana’s pension shortfall one step closer to the state legislature. The State Administration and Veterans Affairs Interim Committee approved drafting a bill from Schweitzer’s pension proposal. Capitol Reporter Dan Boyce says the committee stopped short of throwing its full endorsement behind the bill. Governor Brian Schweitzer’s office is pitching a new strategy to help fix a growing shortfall in the state’s public employee retirement plans. The plans for teachers and other public employees will need more than $3 billion over the next 30 years to break even. 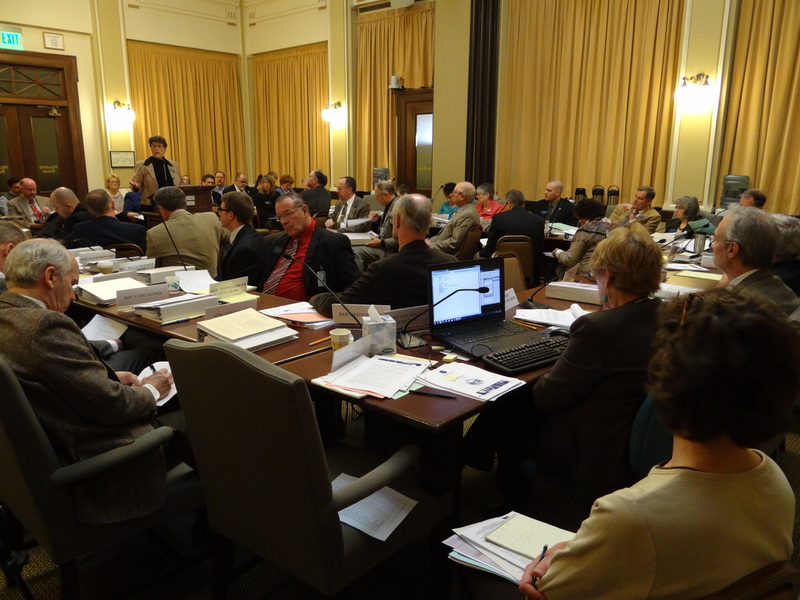 The Governor’s Budget Director spoke Thursday with the committee that would draft legislation to implement this plan. Bozeman Senator, Democrat Larry Jent says lawmakers are obligated to fix the debt problems of the public employee retirement plans. And it needs to happen soon. “As a fiscal priority, I would rank pensions as being the number one priority facing the 2013 legislature,” he said. The Constitution insists these pension plans be financially sound—which they haven’t been for about a decade. And Jent says it’s a moral obligation too, for the nearly 80-thousand Montanans who are either receiving the benefits now or will in the future. Jent sits on the State Administration and Veteran Affairs Interim Committee. That’s the committee in charge of drafting a bill to address this problem. He approves of the new plan from the Governor’s office. There are two retirement plans that are being addressed here—the Teacher’s Retirement System and the Public Employee Retirement System. Each plan has its own financial problems and the Governor’s plan addresses each one individually. But they’re similar. Increase contributions from the employers, like schools, local governments, or the state. Increase revenue coming from state trust lands. Villa says this strategy will make the retirement plans solvent again in the coming decades. And he says it all could be accomplished with reserve funds that do exist or should exist at the state and local level. Wilsall Senator, Republican Ron Arthun has problems with that analysis. He’s interested in the proposal, but he says it would not be a pain-free solution. He says some local governments and school districts may have a hard time finding extra cash. “I’ve talked to many school boards and they are strapped already so I don’t know where the money will come from,” Arthun said, unless that money comes from a local tax increase. Villa says this plan has been released well in advance of the 2013 Legislature to give local governments and school districts time to weigh in. Governor Brian Schweitzer has released a plan he says will fix the state’s ailing pension system. The retirement plans for the state’s teachers and many other public employees have been running in the red for about a decade now. Schweitzer’s proposal includes increasing contributions from both state employees and the agencies that employ them. Lawmakers on both sides of the issue agree something needs to be done soon. The state retirement plans are not solvent right now. That is to say Montana does not have the money set aside to pay them, and it’s on a downward slide. Speaking to reporters, Governor Brian Schweitzer says that’s actually unconstitutional. “You know, there’s some folks who say well, dog-gone it if we don’t have the money I guess we won’t pay them. But it doesn’t work that way. We have a constitutional requirement,” Schweitzer said. The retirement plans split into two groups. There’s the Teacher’s Retirement System and the Public Employee Retirement system. For the Teacher’s Plan, the Governor is proposing a one percent increase in how much the employees contribute. Then, he is asking school districts to contribute a combined one time only amount of about $15 million dollars. With the Public Employee System there would be a one percent increase to both the employees and the employing agencies, like local governments. The third component would be putting in more money from state trust lands. Erik Feaver is President of the MEA-MFT, the state’s largest public employee union. He says he supports the plan, that his members realize something needs to be done. “The fact is this is not unique to the Governor, we’ve been talking about this plan for some time, maybe not in every little detail…he is in part saying the sorts of things we would want him to say if we were actually lobbying him,” he said. The Governor says his plan would make the retirement plans by about 2017. Republican Senator Dave Lewis sits on the State Administration and Veteran’s Affairs Interim Committee, the committee that looks at the pensions. He says the plan may not go far enough. “I’m willing to support looking into some one-time-only money simply to take care of the existing fund, but we’ve got to stop the growth of the problem and the only way to do that is to put new employees into a different kind of plan,” Lewis said. He proposes 401K plans for new employees. The Governor’s proposal would need to go before the 2013 legislature, after Schweitzer has left office.